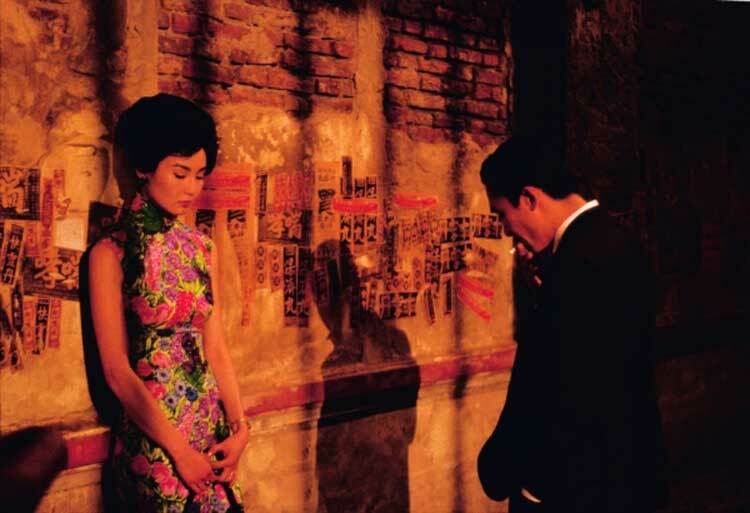 Wong Kar-Wai's 2000 film In the Mood for Love ranks alongside Chungking Express as his most well-known picture and has received great acclaim over the years. The 55-year-old Chinese filmmaker has directed 10 features, with this being his seventh production. Its main characters (or at least a variation of them) also appeared in The Days of Being Wild (1990) and 2046 (2004). 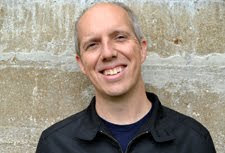 He's known for working without a script and fleshing out the story during production. Critics adore Wong Kar-Wai, who was ranked #3 on Sight & Sound's list of the Top 10 Directors of Modern Times. However, he's not really a household name beyond film experts and deserves more attention. The year is 1962. Mrs. Chan (Maggie Cheung) and Mr. Chow (Tony Leung Chi Wai) move into adjacent rooms in the same building with their spouses. They pass each other on the stairs and build a silent relationship while spending little time with their significant others. The situation changes when Mr. Chow and Mrs. Chan slowly discover that his wife and her husband are having an affair. The couple also realizes they may have romantic feelings beyond that connection. They're unwilling to act on this love, but it continues to grow while their spouses remain absent. Talking around their true feelings yet spending countless hours together, the attractive duo struggles to hide their emotions. There's little chance for a happy ending, but their bond progresses towards a more serious attraction. There's no good reason why I didn't see In the Mood for Love a while ago. It actually was in my DVR three years ago but was lost when we moved into our house. I recorded it again a few months back, and it still took this marathon to force me to watch it. It was clear from the start that my reluctance was misplaced. I'd enjoyed Chungking Express and should have immediately moved on to this equally wonderful movie. Kar-Wai's amazing talent for crafting a sequence rank him among the best currently working. 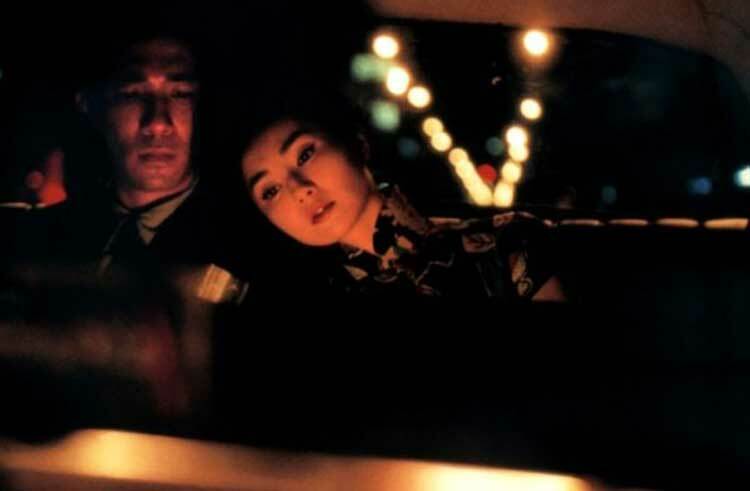 Maggie Cheung and Tony Leung Chi Wai spend most of the film motionless, yet I was still mesmerized for the entire time. This film takes place in the early '60s and incorporates that period's style, but it definitely holds up today. The stunning dresses worn by Mrs. Chan are timeless and remain just as gorgeous now. The remarkable production design helps this film to avoid looking like a period piece and retain a modern feel. This type of story could easily fall into melodrama, but it never goes down that alley. Kar-Wai takes a low-key approach to their romance, with subtle changes indicating the evolution. Cheung and Leung can say plenty with just a glance or a brief smile, so it doesn't take much dialogue to sell it. The characters may be silently hanging out at the rice bar downstairs, but their looks reveal the emotions. This style will likely keep this movie relevant and interesting for a long time into the future. We learn very little about Mr. Chow and Mrs. Chan, but their relationship is compelling and never strikes a false note. 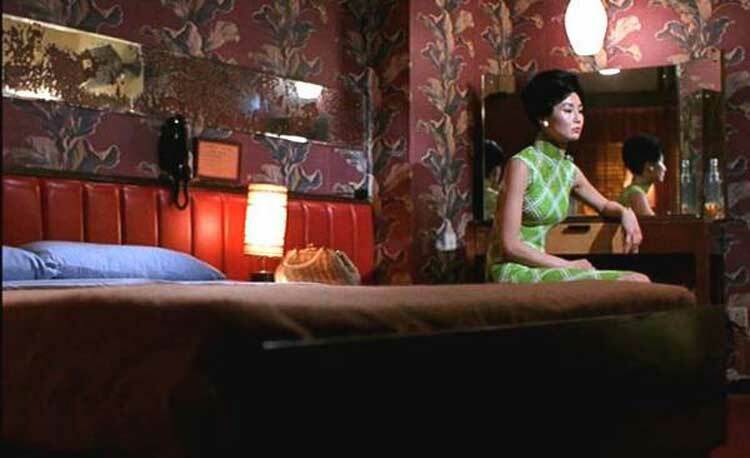 Much of this success is due to Kar-Wai's use of color and music, which make even simple conversations feel exciting. We never meet her husband or his wife, and that's important because they're not essential to the story. Their affair pushes the main characters together, but their connection isn't really about revenge. Their spouses are just partially seen props who appear briefly to remind us of the bigger stakes involved. The other supporting characters also don't play a major role. Mrs. Chan's boss is having an affair with a younger woman, and his activities show her what's needed to maintain the deception. Mr. Chow has a few chats with co-workers and friends, but they don't play the typical role of the Greek chorus discussing his plight. This love story must remain a secret, and even the actual participants try to convince themselves that it's not happening. The majority of the scenes involve characters walking silently by each other and barely speaking, so Kar-Wai finds an inventive way to keep it exciting. He uses repeated interludes with the elegant score to heighten our interest. These remarkable sequences incorporate slow-motion and close-ups to generate just the right mood. Kar-Wai isn't looking to convey plot during these scenes. Instead, he's showing us the subtle ways they're becoming closer. Mr. Chow and Mrs. Chan start rehearsing how she'd confront her husband about the affair. A later moment feels like a truly emotional scene of Mr. Chow leaving for Signapore, but it's just a rehearsal for the real thing. It's also intriguing to note that Kar-Wai removes scenes that would clarify the story's unclear elements. The mystery surrounds what happened at room 2046, and deleted scenes on the DVD make that very clear. By removing this information, he leaves it up to the audience to decide how far the couple actually went. In the Mood for Love is a wonderful film that goes far above even my high expectations. I've heard plenty of acclaim for this movie, but it didn't go far enough. I'm definitely going to check out more of Kong-Wai's career in the near future after seeing this masterpiece. This is one of the best films that I've seen since I started the blog a year ago. I'm also interesting in catching more from Leung and Cheung's careers. This isn't the first time that I'd seen either actor, but the previous work didn't prepare me for their performances here. They take a thin story from Kar-Wai and make us root for the characters. This trio works together and delivers a movie that would likely rank among my favorites from the 2000s. In the Mood for Love is such an incredible film. I watched it for the first time this month too, and I was simply mesmerized. It is one of the most beautiful and best films I have ever seen. However, I was a little disappointed by 2046, so I don't know if I would recommend it to you. I agree about the beauty, which wasn't easy to accurately describe in this post. I'm going to watch 2046 out of curiosity, but I've heard similar things from others, so I'll try to keep my expectations in check. I think it's going to be tough for any of Wong Kar-Wai's other movies to match this one. Chungking Express is pretty close at least. Thanks Mette! I love this film. I'm not a big romance guy, so I didn't have much in the way of expectations going into it and walked away from it thinking that maybe I should start being a bigger fan not just of Maggie Cheung, Tony Leung, and Wong Kar-wai, but of the genre. It's just so pretty. Steve, I'm also not a huge fan of the genre, particularly when there's melodrama. The plot for this movie sounds like it would be overly dramatic and not my thing, but I was blown away right from the start. I'm going to watch a bunch of Wong Kar-Wai movies just because of this film. It's great to see that Maggie Cheung and Tony Leung are in a bunch of them too. I so agree with you two! Being a female, I'm probably a bit more likely to accept and like romance films, but there are so many bad films in that genre. Also, I instantly searched for other films of Tony Leung, Maggie Cheung and Wong Kar-wai, because I think they all did a wonderful job with this film. I liked this film quite a bit. The key word to me is "mood", since the film is all about that. I've also seen 2046. I wouldn't call it disappointing, as much as I would call it unexpected. It's not like In the Mood for Love and I think that most people would expect the opposite since it is a sequel. It's actually only a "sort-of", or "potential" sequel. "2046" isn't just a room number, but also a year. Chip, that's pretty much what I've heard from 2046. 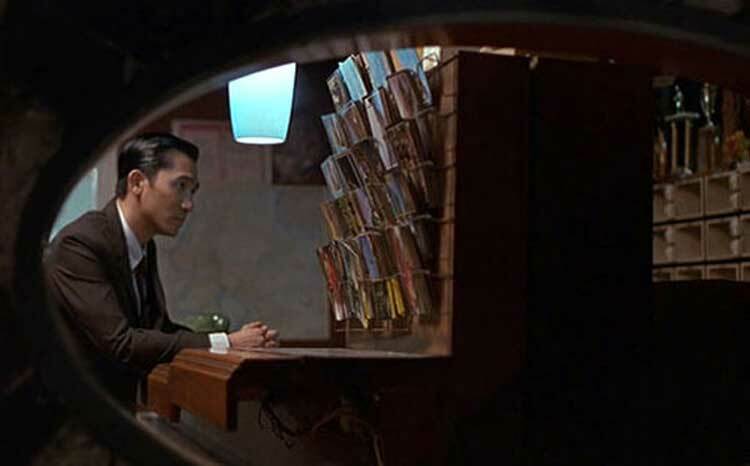 There are some connections to In the Mood for Love, but it's far from a traditional sequel in the normal sense. Thanks! If I love Chungking Express should I not hesitate to watch this? I haven't seen it, but it does sound intriguing. I also hear that for Criterion fans this is one of the most wanted. Max, I definitely think you should check out In the Mood for Love, and being a fan of Chungking Express makes it more likely you'll enjoy it. They're pretty different movies, but Wong Kar-Wai's unique style is all over both films. Thanks! Great review of an amazingly good film. Thanks Steve! I'm glad that I finally took the time to watch it. Now that I've finally gotten to watch this wonderful film (bought the DVD off Amazon), I have a few questions to ask. 1. What did you think of the ending? I didn't really understand showing the stock footage and the brief cuts to them missing each other were hard to follow. At first I didn't understand what he was doing in those ruins, but luckily I remembered what they had talked about earlier. 2. I guess he was whispering what really happened between them. 3. Was that Mrs.Chan in Singapore near the end of the film? She calls and then hangs up without saying a word? I thought it could've been someone else. 4. That musical interlude will haunt me for days now. 5. The fashion designer for that movie was legendary. All my Fiance could say while watching some of the film with me was there was one gorgeous dress after another. All in all, I enjoyed it, but I think I need another watch. Should I watch the deleted scenes or will they ruin my preconceived notions of the movie? Hi Max. The ending was sad, but it worked for me. The part with him speaking into the ruins references what he said earlier about telling your secrets inside a tree. The parts with them just missing each other just showed how close they were to actually re-connecting without realizing it. It's been a few months, but I believe Mrs. Chan was the one who called in the end. I may be wrong, though. I agree that the music and fashion were too of the best things about it. Apparently, Mrs. Chow never wore the same outfit twice. I watched some of the deleted scenes (there are a lot of them), and I don't think they ruin the movie. They do get a lot clearer about what happens in room 2046, though. It takes some of the mystery out of their relationship.